Filter Talent is a West-coast creative outsourcing agency that needed an updated online presence after merging with another agency. We built an xml-driven Flash module as the core of the site, with HTML pages for ease of upload. We also fully assessed and overhauled Information Architecture along with visual design. 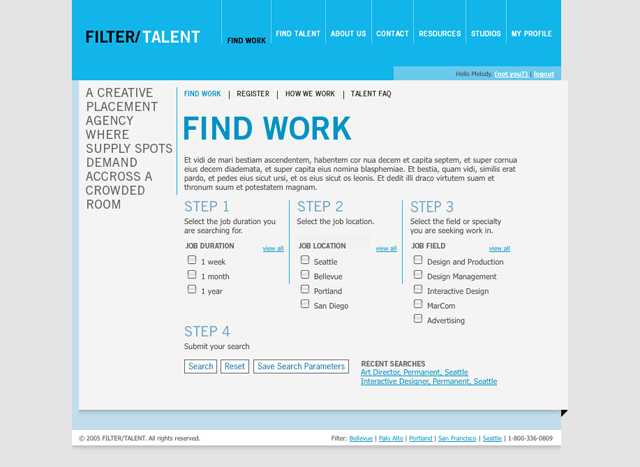 Filter�s site is now current, dynamic, and highly useful for both recruiters and contractors.